SYDNEY (AP) Australia fullback Israel Folau has been banned for one match for his contact in the air with Ireland captain Peter O’Mahony during Saturday’s third rugby test in Sydney. The ban announced Wednesday following a judicial hearing means Folau, who plays for the New South Wales Waratahs, will miss Friday’s Super Rugby match against Melbourne. 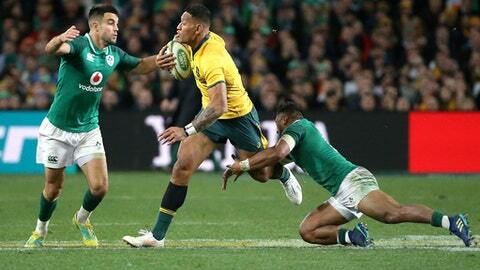 Rugby Australia said later that Folau will appeal the decision. Folau was yellow-carded and subsequently given a citing commissioner’s warning over two aerial contests after O’Mahony, who was lifted by a teammate, landed awkwardly. Earlier Wednesday, Waratahs coach Daryl Gibson said the outcome of the hearing might have implications for the aerial contest in rugby. Gibson said the rules might need to be changed if Folau was banned. Ireland clinched the three-match series with a 20-16 win Saturday.